Specialisations: Yoga in the work place. Yoga and corporate well-being. Janice is a qualified Yoga Therapist specialising in delivering yoga and mindfulness for better mental health. She has been a yoga therapy supervisor since 2014. She is a regular teacher of the Yoga for the Mind 8-week course as well as offering one-to-one yoga therapy. 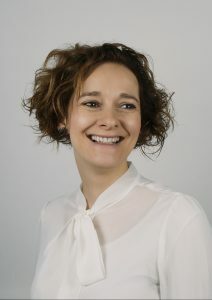 She is particularly interested in how yoga and mindfulness can be used to combat stress in the workplace, having developed a 6-week programme, based on Minded Yoga principles that can be taken into corporate settings. Janice originally qualified as a yoga teacher in 2010 and has taught in studios, complementary health centres and private settings since then. She is the holder of a Master’s Degree in Yoga & Meditation Traditions from SOAS University of London and recently lectured on yoga philosophy to students on the Minded training. Alongside yoga, Janice manages an arts marketing consultancy which puts her in a unique position to advise on the challenges faced by yoga teachers and therapists who juggle their yoga career with other work. Janice has been an Arts Marketing Association trained mentor since 2009 and has mentored many people through different stages of their careers.